Largest Fleet of Rolls-Royce Ghost Motor Cars Anywhere! MAG Group is one of the largest corporations in the UAE (United Arab Emirates) region. MAG Group (Moafaq Ahmad Al Gaddah) is a multinational conglomerate and includes MAG Lifestyle Development. They just announced the largest fleet of Rolls-Royce Ghost motor cars anywhere in the world! MAG Lifestyle Development provides a wide range of servcies, such as affordable housing initiatives and high-end luxury developments to bringing wellness-focused living to the UAE. Their developemnts include luxury high-rise residential towers to expansive, multi-billion dollar communities. As a result, their primary goal is bring wellness-focused living to the UAE. 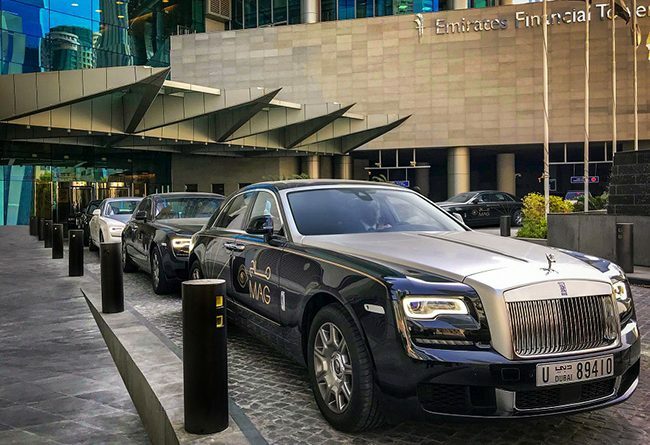 By now offering the largest fleet of Rolls-Royce Ghost motor cars in the world, MAG Lifestyle Development becomes the leading global customer for this ultra-luxury car. In addition, it provides another facet to their mission of always exceeding their customers’ expectations. The Rolls-Royce Ghost was originally announced in April of 2009, at the Auto Shanghai show in China. Manufactured by Rolls-Royce Motor Cars, the iconic British car is the ultimate definition of luxury, in the eyes of many affluent people. The MAG Rolls-Royce fleet originally consisted of twelve Rolls-Royce Ghost models. Due to the rebranding of MAG Property Development to MAG Lifestyle Development, they now include a total of thirty Ghost sedans in their fleet. As a result, the new fleet reflects MAG’s promise to go beyond bricks and mortar. They desire to offer its customers a genuine, new way of living at their luxury developments. The first Rolls-Royce fleet was introduced at the MAG Creek Wellbeing Resort. This luxurious resort became the first wellness-inspired development in the Middle East. In addition, it includes the largest wellness centre in the world. MAG Creek Wellbeing Resort consist of 17 stunning waterfront mansions. Each mansion has been crafted by renowned Italian architect Carlo Colombo and pursuing Wellness by Delos programming. Have you dremed of traveling to Dubai and the AEU? Contact us today and our travel concierge specialists will assist you. We offer a variety of luxury travel services and offer VIP event experiences. You can also puchase a VIP Membership and enjoy the best the world has to offer. Please return and follow our popular luxury blog. Read more stories like the largest fleet of Rolls-Royce Ghost sedans. We cover the latest news in the luxury industry.